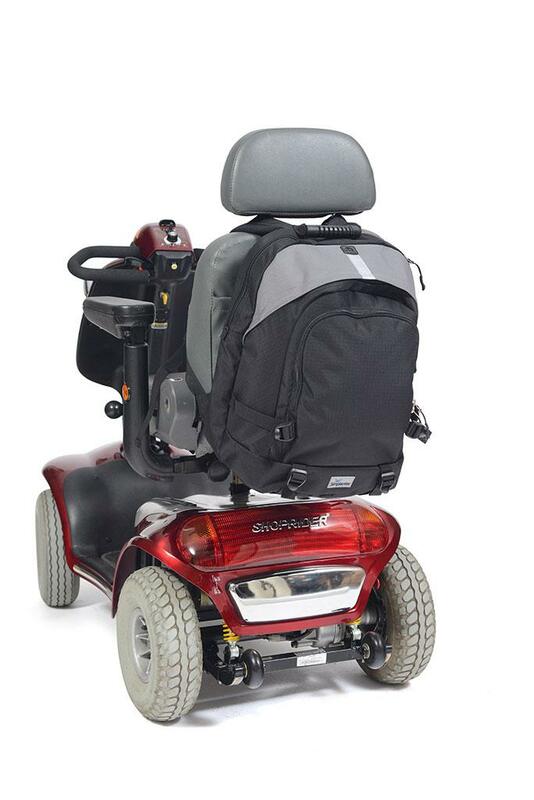 Mobility Rucksack For Use On A Wheelchair Or Scooter. It features three large compartments: the main one has a padded pocket suitable for a laptop while the other compartments provide additional space for small items. There are two mesh bottle holders and a braid system to make the bag depth smaller if its full capacity is not required. 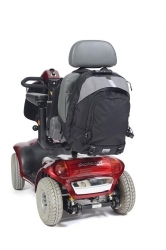 It also has padded shoulder straps and a mesh backing for breathability. The bag is good quality, fits the scooter just fine, although the fastening is centre back, which may prove annoying in warmer weather when I am wearing less layers. the bag doesn\'t hold as much as i would like, but all other scooter bags seem to be so much narrower, and therefore less useful for shopping, all together I am pleased with this bag, but I cant help but wish for a bag as useful as some powerchair bags! The speed I received it was good, no complaints about the service I received.